When you think of cute and romantic love stories, you probably already have a lot of them which come to your head. Napoleon and Josephine or Romeo and Juliet’; their love does not end. The stories fill our hearts and make us set standards in love. So, if you are the kind waiting for your Prince Charming to take you into a ride of love that lasts a lifetime, here is one that you’ll love. Who is this about? Toby Keith and Tricia Covel’s Relationship. Do you know of this happy American couple? They could be categorized into an old heart-wrenching classic that gets better with time. This music power couple left no stone unturned in love – from love at first sight to hardships to decades of sticking by. Three kids and 38 years later, these two share a love that brings in the much trending hashtag #couplegoals its real meaning. 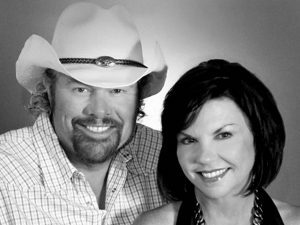 It is known that Toby Keith and Tricia Covel met at an Oklahoma nightclub back in 1981. Both being young and full of energy, hit it off in an instant with a dance. Toby was 20 and Tricia was 19 at this time, but little did the age matter before Toby knew he loved this girl and wanted to spend the rest of his life with her. They dated for 3 different years where they grew to become best friends and of course each other’s lifelong crush. Deciding to take the wedding promises in 1984, they got married on March 24th following which Tricia took up Toby’s original last name Covel’. After their marriage, Keith adopted Shelley, the kid from Tricia’s previous relationship and further went on to have 2 more children of their own. To support this family of 5, Keith started working early on in the oil fields. A dangerous and risky job, he did it all to provide a comfortable life for his family. Once the oil fields dried up, he gave a shot by making a career of his forever lingering passion- music. Performing at local clubs which earned him $35 per night and beer on the house wasn’t truly enough to keep going. He only tried harder at making it big and never quit with the undying support from his wife. Covel has been his biggest cheerleader standing as strong as a rock by her husband throughout. Keith told in a magazine that there was a time where people would tell Tricia “You need to go tell your old man to get a real job,” but it took a strong-hearted & loving woman to say “He’s good enough at music that I’ve got to let him try. And it’ll be a great shot for both of us if he can make it work’”. They say there’s a woman behind every successful man, so Keith eventually sold more than 50 million copies of his album worldwide and made it work’. Their daughter, Krystal has followed daddy’s footsteps by going on to become a country music star like her prominent father. Her first single, “Daddy, Dance with me” went on to become a chartbuster. The genes have passed on to the younger one. Although Tricia isn’t too fond of making public appearances, she tags along with Keith onto the red carpet where millions still wonder how they manage to fall in love every day. With real talent and an affectionately cooperative wife, Keith has made it big. From meager livings to having an estimated worth of 500 million dollars, his total career earnings is surely giving them the most comfortable life one can hope for. Knowing the hardships to make ends meet, this couple now tries to give back as much as they can to give hope to the struggling ones. Their philanthropic activities are plenty although the highlight has been on OK kids Korral’, which is a facility which provides shelter for families whose kids are undergoing cancer treatments. To honor their work, they have been presented with the Door Opener Award’ in 2014 by ASTEC. The two were overwhelmed and spoke in an interview about how glad and content they are to be able to do so much for the society. Now a grandfather, Keith still talks about his love for writing and performing songs but what’s closest to his heart is the invaluable time at home with his wife and kids. He feels a sense of relaxation being with family and having their little moments considering it the best feeling of all. Are we jealous or what to come across such a tightly knit family? Love stories like this aren’t made any more or are they? There’s something about love stories in novels and movies that makes you swoon every time you hear one. This one is no different. It takes time to understand the concept of love and dwell in it whole-heartedly. It has passed the test of time and continued to stand as the strongest foundation right from Day One. The most celebrities marriage of all time finds a love story to tell the world and let them know the key traits to keep love alive. Jump under the covers and say to your friends and kids of this love so pure and endearing that even our hearts can’t contain it anymore.